Social workers can help clients who are caregivers for elders with dementia by sharing these tips to enhance mobility and safety in the home environment. Receiving a diagnosis of Alzheimer’s disease or a related dementia is difficult enough, but adapting the home to best address the needs and safety of an older adult presents a major challenge. The good news is that there’s a wealth of information and resources available and easily accessible. But flexibility holds the key to success. Regardless of calculations and preparations, dementia patients’ needs will change. It’s essential to look at the home in a brand new light. What hazards exist that could be easily removed? What environmental features should be introduced to foster independence while maintaining safety? And perhaps the most difficult question: Where does someone begin? • Senses: for example, experiencing changes in vision, hearing, sensitivity to temperature, or depth perception. Clearly, these changes underscore the importance of flexibility. Some elders with dementia may experience all these changes at once, while others may never undergo a change in behavior but may experience a drastic decrease in physical ability. Some may experience only moderate changes in these areas, but these changes may occur over a longer period of time. There is no timeline for such transformations, making the challenge of adapting the home all the more difficult. • Assess the home: Look at the home with consideration of the patient with dementia. What objects could cause injury? Identify areas of possible danger. Is it easy to get outside or to other dangerous areas such as the kitchen, garage, or basement? • Focus on adapting rather than teaching: Rather than trying to reteach an elder about safety, identify possible risks and take preventive precautions. • Simplify the activities: Most accidents, especially in the area of personal care, occur when an elder is rushed. Break up activities into simple step-by-step tasks, allowing the individual plenty of time to complete them. Give extra help with tasks that have become particularly difficult. • Support the individual’s needs: Avoid creating a home that feels too restrictive. The home should encourage independence, social interaction, and meaningful activities. • Be realistic about limitations: It’s impossible to prevent every problem. Rely on common sense while paying close attention to objects or activities that could be dangerous. As environmental, emotional, and other unexpected barriers present themselves, these five principles become crucial. Building a home requires careful planning and meticulous craftsmanship; creating the home to adapt to an elder’s ever-changing needs is the same. A personalized action plan is highly recommended by professionals like Catherine Verrier Piersol, MS, OTR/L, clinical director of the Living Laboratory for Elder Care in the Jefferson Center for Applied Research on Aging and Health and an assistant professor in the occupational therapy department at Thomas Jefferson University in Philadelphia. “We have developed a standardized approach to prevent certain problems from occurring within the home,” says Piersol, who firmly believes that negative outcomes such as wandering can be prevented with this proactive method. Piersol and the team of experts at the Living Laboratory, which serves as a venue for hands-on research and interventions, work with clients to create a strategic, problem-solving approach that identifies antecedents to behavior (triggers). The team considers what the individual’s trigger may be before anything happens and then seeks a way to make the environment conducive to prevention. A common trigger is boredom; in this case, Piersol and her team help caregivers figure out what type of activities will engage the care recipient. Knowing the trigger can change the consequences of the behavior—all before a problem actually occurs. If the elder is prone to wandering, alarms on doors provide one possible solution. A creative approach would involve covering doors that lead outside with a mural that looks like a bookcase (the Alzheimer’s Store is a good source for such equipment for home adaptations) or even a simple stop sign, which is easily recognizable to a person with dementia. Meredith Gordon, safety services coordinator for the Delaware Valley Chapter of the Alzheimer’s Association, recommends placing a small black area rug in front of a door to prevent wandering. The individual may see this rug as a black hole and avoid exiting through that means. • Create a clutter-free environment, removing misleading stimuli and minimizing background noise such as the radio or TV; put items away when not in use. • Communicate effectively, as caregivers’ reactions and approaches—verbal and nonverbal—can change everything. • Simplify tasks, for example, if an elder is having problems brushing his or her teeth, you may just need to model the action first or prepare the toothbrush with water and toothpaste before handing it to him or her. • Engage elders to prevent boredom, depression, and agitation. “Our approach for working in the home also takes in the unique cultural environment,” Piersol adds. This is important because it helps reduce the elder’s agitation if the spirit of the home remains intact even as changes are made to ensure safety. Besides the flexibility and the formulation of an action plan, focusing on the patient with dementia and not simply the physical environment is another important building block. Creating a dementia-friendly home is more than just putting locks on cabinets and alarms on doors. According to the Alzheimer’s Association, effective activities bring meaning, purpose, joy, and hope to the elder’s life; use the individual’s skills and abilities; give the individual a sense of being normal; involve family and friends; are dignified and appropriate for adults; and are enjoyable. “Meaningful, purposeful activities allow persons with dementia to stay home and be successful,” says James Siberski, MS, coordinator of the Gerontology Education Center for Professional Development as well as an assistant professor of gerontology at Misericordia University and an adjunct professor of psychiatry at Penn State University. 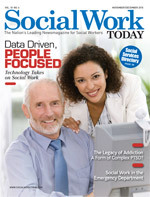 Christa Caruso, a research interviewer at the Center for Applied Research on Aging and Health, agrees with Siberski’s assessment that the dementia patient should remain involved in regular activities around the home, such as setting the table for dinner or helping with laundry, provided the individual doesn’t get frustrated with these tasks. Such tasks affirm that the elder is still contributing as an active member of the family. Siberski believes that maintaining the brain is a crucial part of creating a dementia-friendly home, whether this is accomplished through computer programs, Sudoku puzzles, or other brain-related exercises. “We have to keep challenging the person,” Siberski says. One of his clients, a 95-year-old woman still living at home, just finished a major task: sorting a massive collection of nuts and bolts. The project took months, but she enjoyed it and it gave her purpose. Look to the individual’s life history for cues on activities. Tasks such as snapping peas or husking corn may be comforting and familiar to a woman who grew up on a farm or prepared meals from scratch for her large family. Taking a small motor apart and putting it back together could be highly rewarding for a man who is fascinated by mechanical objects. Tailor the activity to the person and remember that the diagnosis does not erase personhood. As long as the activity holds meaning and purpose for the individual, it doesn’t matter whether the caregiver really needs the nuts and bolts sorted or the peas snapped. The television, a central component in many American households, is often misused or abused regardless of a dementia diagnosis. All too often, older adults with dementia either in home or residential care settings are left in front of the TV for hours for any number of reasons, such as a lack of activities or staffing or overmedication. At home, situating the elder in front of a television for extended periods of time may result from caregiver burnout or the caregiver may reason that the individual enjoyed watching TV before the diagnosis, so the activity is justified. Ultimately, keeping the elder’s agitation level down is the goal. If watching the evening news was a regular, meaningful activity for the individual prior to the diagnosis, it may be necessary to closely monitor responses for an increased agitation level and perhaps reduce the length of time spent watching the news. Also, suggest that when the television is on, the volume is not too high. If a caregiver needs to ask the elder a question, he or she should mute the TV so the individual can focus on the question without competing noise. • In the kitchen: Lock up cleaning supplies. Turn off electricity to the garbage disposal. Hide knives and other utensils. Store small appliances such as the toaster and the blender. Unplug larger appliances such as the microwave. Remove knobs from the stove; connect the stove to a hidden gas valve or electric switch. Keep a fire extinguisher nearby. Clean out the refrigerator regularly. • In the bathroom: Set the water temperature at 120˚F or lower. Install grab bars. Add textured stickers to slippery surfaces. Supervise the use of hair dryers, curling irons, and electric and hand razors. Remove locks from the bathroom door. Remove dangerous items from medicine chests. • In the bedroom: Avoid using electric blankets. Monitor the use of heating pads. Install night lights between the bedroom and bathroom. • In the garage: Lock up hand and power tools such as drills, axes, saws, and picks. Limit access to large equipment such as a lawn mower, a weed trimmer, and a snow blower. Lock up poisonous chemicals such as paints and fertilizers. • Throughout the home: Disguise outdoor locks or install dead bolts. Remove or tape down throw rugs and carpeting. Apply colored stickers to large windows and sliding glass doors. Remove poisonous plants. Create an even level of lighting near doorways, stairways, and between rooms. Remove objects that block walking paths. Remove and disable guns or other weapons. • Outdoors: Disconnect gas hookups from grills. Lock fence gates. Supervise elders, especially in areas that are not enclosed. Put away car keys. If caregivers are unaware of their own needs or push those needs aside, both the caregiver and the elder will be at risk. Caregiver burnout is an unseen but all-too-common hazard; it won’t matter how many nonskid rugs are placed or how many door alarms are installed if caregivers are unable to meet elders’ needs. In many cases, caregivers may have health needs of their own and could themselves benefit from a safer, more streamlined environment. Making certain adjustments for individuals with dementia can make other residents’ lives easier, too. All the members of a household can participate in the process. Children, grandchildren, or other family members can offer valuable insights that may otherwise go unnoticed. Such input also ensures that when their help is needed, all household members have been included in the decision-making process and are part of the action plan. West also affirms the importance of caregiver flexibility. “Any modification that is made can easily be reversed. The goal is to encourage independence for your loved one and to make sure that caring for him is safe and as minimally stressful on the caregiver as possible,” she notes. This goal of independence for the older adult and reduced stress on the caregiver is paramount, since there is rarely a time frame accompanying the diagnosis. The elder may live at home for five years or 15. The individual may stay in the early stage longer than the end stage or vice versa. “As mobility became more challenging, I had a ramp installed in the garage so that steps could be avoided,” West says of her experience. “Living in a ranch-style house made all the difference in the world since everything was all on one floor. Extra-wide doorways made use of a walker and a wheelchair safe and easy. An extensive support system of family, friends, and neighbors is equally important. As the challenges of caregiving intensify, the caregiver will need the support of the surrounding community to prevent isolation or depression. In addition, if the diagnosed individual wanders away from the home, neighbors will be aware and can assist in times of need. We have all heard the expression “it takes a village,” and this certainly applies to caring for an older adult with dementia. The disease exacts more than one person can truly handle without endangering his or her own health and wellness. The challenge of caring for and keeping safe an elder with Alzheimer’s or related dementias is one that must be taken seriously. There are changes that must be made to make the home dementia friendly. Sometimes, those changes need to be undone. As providing care at home for as long as possible continues to be a popular option, due to the rising costs of skilled nursing or assisted living facilities and the desire of the diagnosed individual to remain at home, maintaining an elder’s independence and dignity, this is clearly a challenge facing many 21st-century families. — Michelle Seitzer is the former public policy coordinator for the Pennsylvania chapters of the Alzheimer’s Association and a blogger at SeniorsForLiving.com.